Because it's time to try something new. June/July 2015 Newsletter: Pack Your Bags! Summer's Finally Here! Since we started ActiveTravels three years ago, we've been fortunate to grow our business by word of mouth, not having to advertise at all. This is a direct result of all of you telling your friends about our services. Lately, we've been booking a ton of travel for new clients that have been referred to us. Nothing makes us happier-to not only entrust us with your valuable vacation time, but to spread the word to your friends about what we do. We can't thank you enough! This is our annual June/July issue. Like many of you, we'll be traveling with the kids once school ends in late June. This summer, we're off to Istanbul and Cappadocia. We'll report back on our adventures in the August issue. Don't worry, our trusty assistant, Amy Rose, will be in our office fielding calls and emails during our absence. I just arrived in Nova Scotia after the overnight ferry from Portland, Maine. 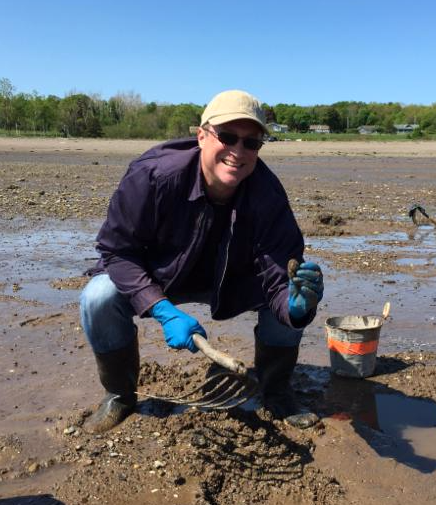 To give you a little taste of what I'm experiencing in this Atlantic Maritimes province, our "News from the Road" feature is devoted to Nova Scotia. 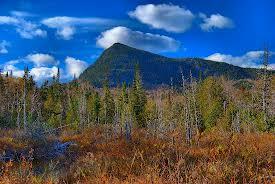 In mid-July, Lisa and I will be hiking, biking, and paddling our way to the four huts of the Maine Huts & Trails system, as discussed in our Quick Escape. Also in this issue, Lisa talks about her favorite hotels in Hong Kong, an outfitter we use in Asia to book trips to Bali, Vietnam, and Cambodia, and luggage that has its own GPS system, so you know exactly where it is at all times. There's no better way to taste the bounty of Nova Scotia than to enjoy a bowl of seafood chowder. 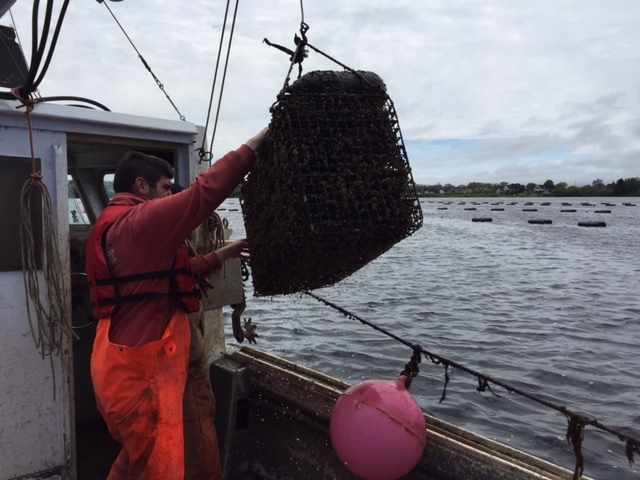 Restaurants take the finest seafood-lobster, clams, scallops, and mussels-from the surrounding cold, clean waters and pair it with produce from the fertile valleys. New this summer is a Chowder Trail where you can taste 61 different varieties of seafood chowder across the province. 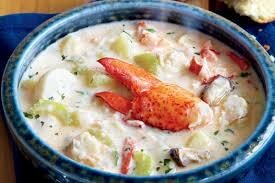 I plan on tasting my fair share of chowder this week when returning to Nova Scotia with my sister, Fawn. We'll also be boating to the Eel Lake Oyster Farm to sample their succulent goodies, go clamming on Smith Cove Beach, stop in Digby to try the scallop that's become a mainstay on North American menus, and end our trip with a lobster bake after first kayaking Lobster Bay. This will be my third trip to the province in the past five years and the first time since I was a child that we'll be going via the overnight ferry from Portland, Maine. Once the ferry service ended in 2009, New Englanders were forced to drive through New Brunswick to reach Nova Scotia, making the trip far more arduous. 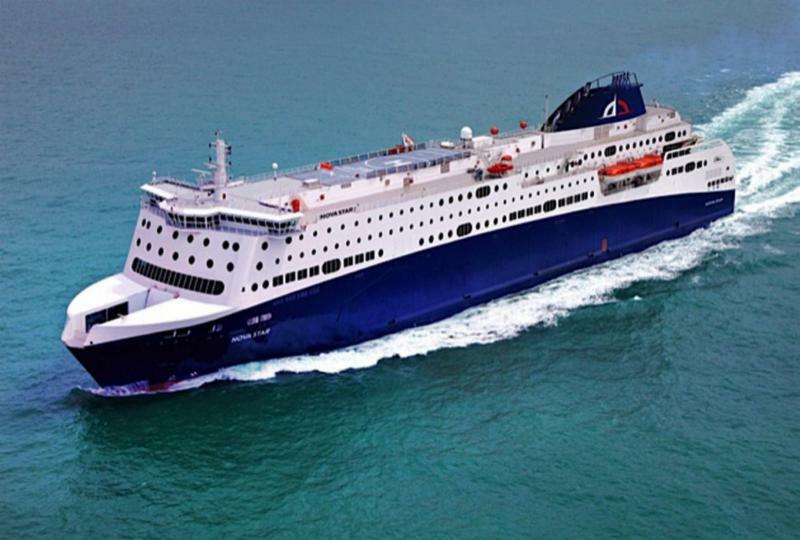 Nova Star Cruises now leaves Portland each evening at 8 pm EST and arrive in Yarmouth at 7 am AST the next morning. The ship departs two hours later and arrives back in Portland at 5 p.m. local time. 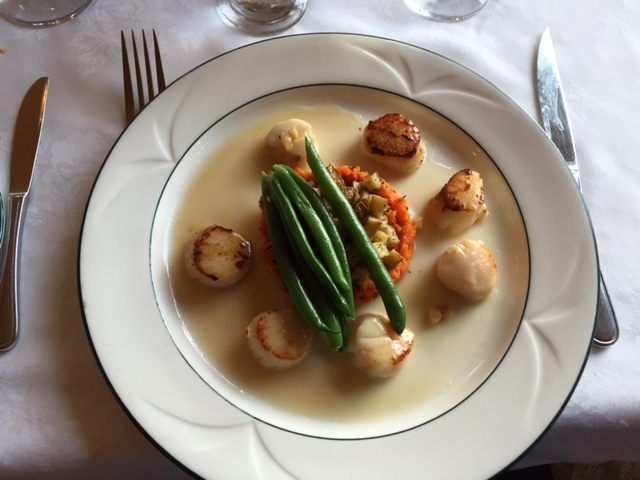 I'll be driving the southern loop on this trip, starting in Yarmouth and heading north to the picturesque seaside town of Lunenburg, the farming and growing wine region of Wolfville, then down to Digby to try those scallops. The college town of Wolfville is the gateway to the Annapolis Valley, where folks spend the day sampling the wares from wineries that produce decadent icewines and Champagne-style sparkling whites. Wolfville is only an hour's drive west of Halifax, where you can pop into the Halifax Seaport Farmers' Market. Grab a lobster roll overflowing with meat or fish and chips at The Fish Shop. Wash it down with a local soda, Garrison. Or venture over to the Avondale Sky Winery stall for a glass of sauvignon blanc, Riesling, or Gewurtztraminer. The venue is also a good spot to bring back a souvenir, like jewelry made from sea glass, folk art, or the handcrafted cutting boards from Swaine Street Woodworking. Halifax is also home to the wonderful Maritime Museum of the Atlantic, which houses more than 50 artifacts from the Titanic, including the last remaining deck chair. To mark the 100th anniversary of the Titanic tragedy, I penned this article for The Boston Globe. A 4-hour drive north of Halifax and you reach the stunning backdrop of Cape Breton. It's no surprise that Travel & Leisure magazine named Cape Breton the number one island destination in North America and third in the world. The landscape is a mesmerizing mix of rolling summits, precipitous cliffs, high headlands, sweeping white sand beaches, and glacially carved lakes, all bordered by the ocean. 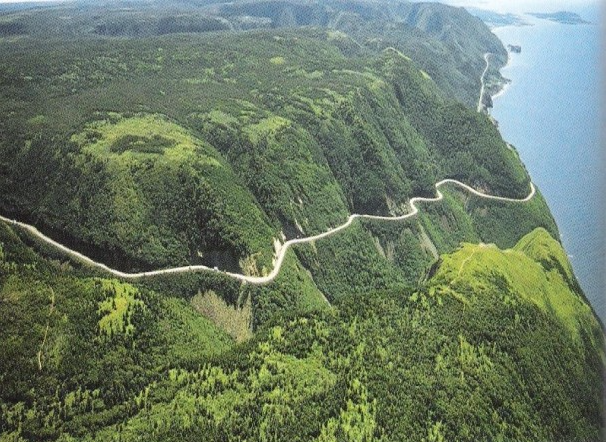 The Cabot Trail hugs the Gulf of St. Lawrence on the rugged northwestern edge of the island, where around every bend you want to pull over, spew expletives of joy at the stupendous vista, and take another snapshot. Indeed, it's as close to Big Sur as the East Coast gets. Add bald eagles, moose, coyotes, and pilot whales fluking in the nearby waters and you want to leave the car behind and soak it all up. Adding to the allure is that you're bound to find a foot-stomping fiddler concert every night from June through October. Here, in the heart of Ceilidh "kay-lee" country, it's a good bet that your waiter or bellhop has played to a crowd and can dance the two-step, either in a nearby barn or in a packed concert hall. Golfers will want to know that the Cabot Cliffs golf course is set to make its debut on Cape Breton in July. Golf Digest has already called the Ben Crenshaw and Bill Coore designed course an instant classic. Cabot Cliffs sister course, Cabot Links, opened 3 years ago and is already ranked as the 42nd best golf course in the world according to Golf Digest. This one might break into the top 10. The seascape here is comparable to the cliffs of the Scottish Highlands, so it should come as no surprise that the golf is just as good as Scotland. Still need a last-minute summer escape? Take advantage of the wonderful exchange rate with Canada, now $1.22 Canadian to the US Dollar, and allow ActiveTravels to design a memorable Dream Day Itinerary to Nova Scotia. 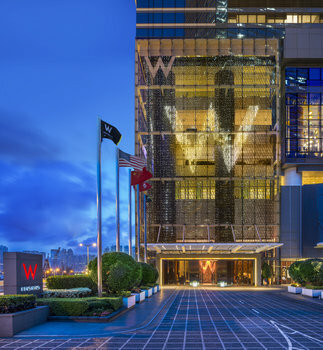 Hong Kong is a destination where East truly meets West. It's perched right on the edge of China and preserves their ancient customs, yet its vibrant harbor and port connects it with the capitalist West. Poised on several levels, this city is at its highest at Victoria Peak, on Hong Kong island, where the elite enjoy their mansions. Below one witnesses the jungle of skyscrapers where business and commerce thrive. On the water live Hong Kong's fishing families who have inhabited these shores for centuries. Across the harbor is Kowloon, the mainland, and the suburban New Territories where Hong Kong's Disneyland resides. Most people imagine Hong Kong to be dominated completely by skyscrapers. 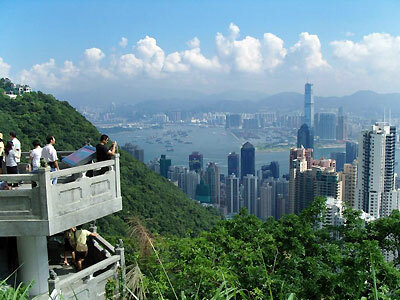 Truth is that 38% of all land in Hong Kong is designated as national parks and green areas. Amazing hiking trails, both for the novice and expert, can be enjoyed in these scenic spaces. This hotel exudes understated elegance and calm with its natural woods and plethora of Asian art and sculpture. 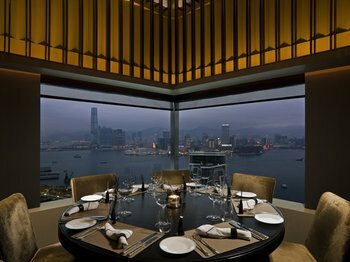 Its restaurant on the 49th floor offers gourmet cuisine and a cozy Sky Lounge allows for magnificent views of the Hong Kong skyline. 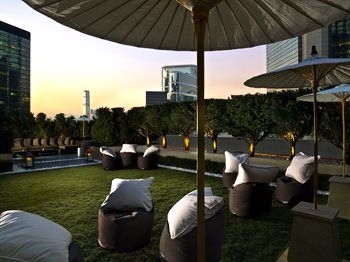 On the 6th floor, you can wind down and enjoy a cocktail at happy hour on their grassy terrace dotted with lawn chairs and bean bags. If you like to shop, just take the elevator down to Pacific Place. No need to carry those bags all over the city, just elevator up to your room to drop them off. The views from the guest rooms of the harbor or the island are spectacular. offering DJ entertainment several nights a week. Its rooftop pool on the 76th floor is Hong Kong's highest outdoor pool and is heated so can be enjoyed all year round. Guest rooms are larger than most in the city, and this hotel offers a better bargain for price-conscious travelers. Features are their huge wine cellar, Starbucks, a fine dining restaurant and an open-air lounge with BBQ menu overlooking the city. Family rooms are offered here. 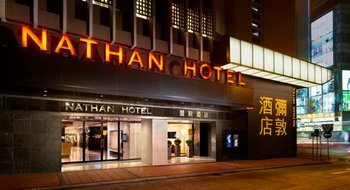 Very close to Ladies Street and Night Market, two excellent shopping venues. If you are curious about traveling to South East Asia, but don't know where to begin, give us a call. We have excellent contacts in this region due to our growing relationship with the travel experts at Trails of Indochina. 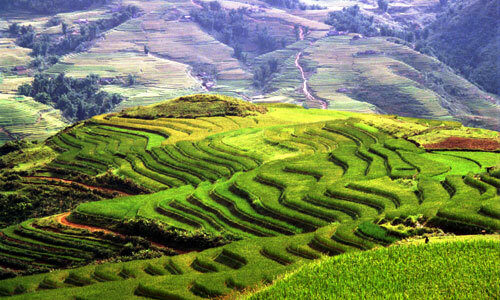 Their expertise lies in the five destinations of Vietnam, Cambodia, Laos, Thailand and Myanmar. However, they also focus on Indonesia, China, Hong Kong and Singapore. This is not your typical tour company. They only design customized itineraries for independent travelers and we can't recommend them enough. 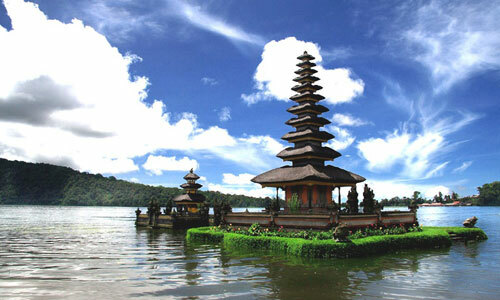 Trails always adds experiences into their itineraries so some of our clients traveling to Bali won't just visit the magnificent Hindu temples while there but they'll have a "Spiritual Journey" complete with meeting with a Balinese shaman to open their chakras, joining in on a purification ceremony at a small temple near a river known to have healing properties, meditating in a cave, and enjoying yoga in a beautiful garden. Take a look at their excellent website chock full of sample itineraries, maps of these destinations, and examples of some of their "Tailored Experieces." 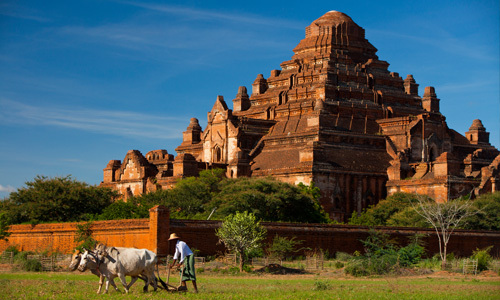 Give us a call and we can collaborate with you and Trails of Indochina to create an unforgettable vacation. Don't you hate that feeling when you are at the luggage carousel after a long and arduous flight and you have a sneaking suspicion that your suitcase will not be coming down the conveyer belt? On my last international trip, I was so proud of myself for having Global Entry, making my travel through customs a breeze in just a few minutes. This feeling of euphoria quickly vanished as I waited and waited for my bag to appear, wondering if it made the connecting flight like I did. down if you buy multiple units. How does it work? First charge the device with a mini-USB, register the unit online, and insert it into your luggage. With your device, you get 15 days of unlimited traces. Following that, you can purchase individual traces at prices that range from $6.99 for 5 traces to $29.99 for unlimited traces. 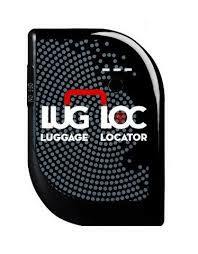 Using their mobile app, you can track a suitcase to its general location. 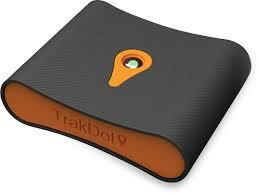 Caveat: it can only be tracked to a general area, rather than a specific locale. includes tracking for the first year and $19.99 per year afterwards. Smaller yet thicker than LugLoc, it takes 2 AA batteries for its charge. A nice feature is its ability to text your smartphone to notify you where your bag is located during your travels. Okoban Luggage Tags. 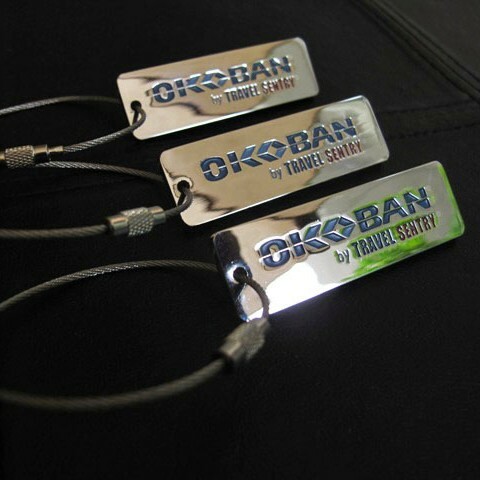 Three metal Okoban UID luggage tags cost $19.95. 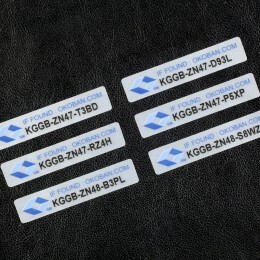 Six Okoban UID Tracker T ags cost $19.95. A combo pack is $34.95. Purchase Okoban UID tags and attach them to your valuable items (luggage, passports, laptops,, tablets, keys, purses, cameras for example). register an unlimited number of UIDs for free with a description of each tagged item on the website . 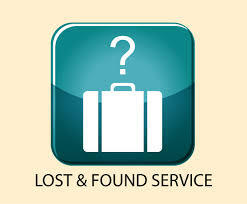 If your item is lost, the finder can email and text you the recovery location through Okoban.com. 1) Remove all your old baggage tags as an old bar code could take your bag on a different route than you intended. 2) Use multiple forms of ID in case one gets lost. You can also put a business card inside the luggage if your backup gets chewed up as well. 3) Take a picture of your luggage. This helps if you need to file a missing baggage report. You could even take pictures of some of the contents to make a claim for compensation from the airlines and any credit cards you used to charge your flight. Some credit cards do offer lost luggage compensation. 4) Enlist one person in your party to double check the airline baggage tag at check-in. Make sure it goes all the way to your destination and not to your stopover on the way. 5) Pack as if it may go missing: no valuables, medications, electronics, keys or jewelry. And, pack an outfit in your carry-on just in case. 6) File a claim immediately if your bags are lost or damaged. If you arrive late and cannot make a claim at the airport, take a picture of the closed office and call the airline before leaving the airport to make sure you can't make a claim. 7) If the airline loses your bag, demand your bag fees back! Request a reimbursement for those fees. 8) If you pay for your flight with a credit card, find out whether you can take advantage of their insurance for lost or delayed baggage. 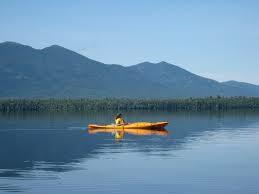 In July, Lisa and I are excited to hike, pedal, and paddle to all four of the Maine Huts. If you don't already know of this wonderful nonprofit organization, Maine Huts & Trails is hoping to build 12 backcountry huts over 180 miles of trails in the remote western mountains of the state. grab a bunk at night. Each hut also has a couple of "private" bunk rooms that host a double-sized bunk. two miles below the cascading waters of Grand Falls. Each of the four huts, including the Poplar Stream Falls and the Flagstaff Lake hut, are spaced about 11 miles apart, so people can reach the next one within one day of hiking. 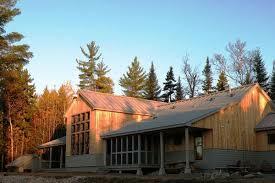 Unlike the AMC Huts, you also have the chance to mountain bike and paddle between the huts. For less than $100 per person per adult and under $50 per children, each hiker gets a night's sleep on a bed, hot showers, dinner, and breakfast. 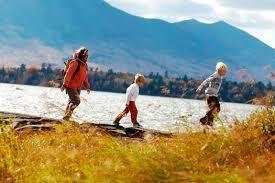 wilderness, treasured for its mountains, large lakes, sinuous rivers, and waterfalls. 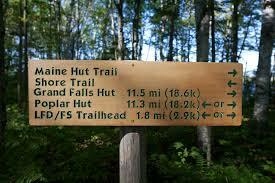 Check out Maine Huts and Trails any time of the year. We'd be happy to help organize your journey.